The Storey website's errata for the pattern aren't loading for me, so here's the updated chart with the rows where you need to move the markers starred. Since the floral mesh shawl isn't included in the latest One Skein Wonders errata, here's the corrected (and somewhat expanded) version. 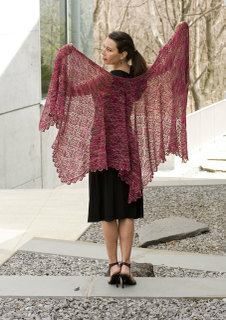 This is a large but lightweight shawl in a fairly complicated lace pattern, so it's best suited to experienced lace knitters or knitters with less experience and lots of enthusiasm. I've knitted it twice and still adore the rose trellis stitch pattern. Download the revised PDF with new! improved! charts and directions.